Three self-powered radios and a solar-powered portable Bluetooth sound system have been unveiled by American green technology company, Eton Corporation. The devices can all be powered by alternative means, which means they can be used in severe weather and disasters. Two of the safety radios, FRX2 and FRX3, can be powered by the sun and hand turbines. The third, FRX1, just has the hand-turbine. The 'Rukus Solar' portable Bluetooth sound system features battery and solar-powered versions. CEO, Esmail Amid-Hozour, says, "At Eton, we urge consumers to think about preparedness before disaster hits. Last year presented many severe weather situations and our mission is to help all families be empowered by safety and preparedness as we enter 2012." The products are exclusively co-branded by the American Red Cross, a donation from each sale going to the charity. The products will be available in spring 2012 at recommended prices of $25 (£16) for FRX1, $40 (£26) for FRX2 and $60 (£39) FRX3 (below). They come in red or black. 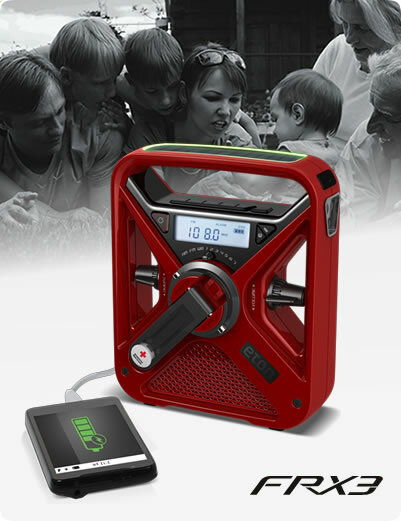 The Rukus (top) is the first portable Bluetooth sound system to feature a solar panelto ensure it never runs out of power. It can stream music from any devise with Bluetooth and has two full-range speakers for top-quality sound. It takes around hours of sunlight six to fully power the battery and it can be charged with an AC adapter. The Rukus includes a USB port that can recharge mobile devices. Its E Ink SURF display uses less power to display information than traditional LCD screens. It has a 180-degree viewing angle and provides clear visibility even in direct sunlight. Mr Amid-Hozour says, "Rukus is truly the only Bluetooth sound system you may never have to plug in With its unique design and portability, the sound system is the perfect addition to any indoor or outdoor area - causing a ruckus wherever it goes. Sriram Peruvemba, Chief Marketing Officer of E Ink Holdings, adds, "Rukus is a versatile product. The high-contrast and low-power requirements of our E Ink SURF segmented display makes it well-suited to the product's design. "We are always looking for innovative new ways to incorporate our technology and Rukus is one of the most unique products we've seen." The Eton Corporation has been producing environmentally friendly products for more than 25 years. It aims to provide top-quality design and performance, while using the power of nature to run long-lasting products. For more information on the Eton Corporation and its products, visit their website.